It’s the movie that made us all dream. Back to the Future II, released in 1989, has the protagonist Marty McFly jumping into the future The Best Time Travel Movies of All Time The Best Time Travel Movies of All Time Time travel can make even the dullest movies more interesting. And the best time travel movies are truly mesmerizing slices of cinema. You really should see these flicks, either now or in the future. Read More to show us a world full of hoverboards, holograms and clean energy. That “future” was dated October 21, 2015. This glimpse into the future lasts for only the first 40 minutes of the film, but even in that limited time, the filmmakers introduce a host of new technology. How much did they get right? How close is the science fiction of 1989 to the science reality of today? Let’s take an in-depth look at this retro-futuristic movie with this, the ultimate guide to the gadgets of Back to the Future II. While not a part of how director Robert Zemeckis thought the future would turn out, the first piece of technology you see in Back to the Future II is the DeLorean DMC-12, the car-come-time machine. It’s what lets Marty McFly and Doc Brown travel through time. Reality Check: In real life, we aren’t anywhere close to developing such a device. Scientists still argue about whether time travel is even possible, let alone worry about building a machine. Every once in a while, some inventor claims he built one, only to be panned by researchers across the globe. Time travel remains a theory, and even its supporters have their doubts. Renowned physicist Stephen Hawking, he of The Theory of Everything, has stated he believes humans will be able to achieve time travel in the future. But then again, he hosted a party for time travellers and no one showed up. Hey, if a future time traveller doesn’t think it’s worth going back in time to meet Dr. Hawking, that’s not a time traveller I want to know. As Doc Brown pulls into Marty’s driveway and urges him to come with him to the future, he also realizes he is running low on fuel. The scientist rummages through the trash can nearby and grabs whatever food he can get, and chucks it into Mr. Fusion, a device that converts food waste into car fuel. Mr. Fusion can take anything from bananas skins to Pepsi (including the bottle), and keep chugging along. Reality Check: While there isn’t a single device that can convert all kinds of food into fuel, boffins are actively making some headway on this front. Biodiesel is perhaps the biggest of these industries, and the leading resource in that is turning the fat from junk food into fuel. Sweden’s authorities are turning confiscated alcohol into alternative fuel, making it one of the coolest ways to generate electricity 8 Unbelievable New Ways of Generating Electricity 8 Unbelievable New Ways of Generating Electricity Alternative energy is one the rise, but you may not know about all the options. Here are some of the craziest new ways of generating power. Read More . And then there are enthusiasts who have even set speed records with coffee-powered cars. Perhaps the most epic, memorable line of Back to the Future II, Doc Brown allays Marty’s fears about not having enough road to hit the desired 88 mph speed for time travel by simply making the car fly. That’s right, in the future, all cars will fly and roads will be replaced by highways in the air. You’ll still get traffic though, as the movie shows later on. Damn! Reality Check: We actually have a flying car already! In fact, we have two companies leading the innovation in this department. The Terrafugia Transition is already a reality and has been tested several times. It isn’t road-ready yet because the laws and rules for such vehicles don’t exist, but you can reserve it now. Then there’s the AeroMobil 3.0, which could go on sale as early as 2017. But what has me most excited is the Terrafugia TF-X, although it’s just a concept right now. Flying cars! And you thought self-driving cars were cool How Self-Driving Cars Will Change Transportation Forever How Self-Driving Cars Will Change Transportation Forever As we move into 2015, the question is no longer whether self-driving cars will replace manually driven cars, but how quickly they'll take over. Read More . As Marty’s girlfriend Jennifer gets excited about seeing the future, Doc Brown realizes he needs to calm her down. He whips out a Sleep Inducing Alpha Rhythm Generator, aims it at Jennifer’s eyes, and she falls asleep in seconds. The concept is based on science that says “sleep” is a form of brain rhythm, and so the device mimics the rhythms that signal your brain to fall asleep. Reality Check: Unfortunately, we are nowhere near such technology. Gizmodo explains in detail why we don’t have such technology, speaking to several experts. The closest thing is the Somneo Sleep Trainer, a mask to help soldiers achieve deep sleep in seconds, but it’s still not ready. On the bright side, while we can’t fall asleep immediately, we have made progress on remaining asleep. In fact, some apps can really help you sleep better Can An App Really Help You Sleep Better? Can An App Really Help You Sleep Better? I've always been a bit of a sleep experimenter, having for much of my life kept a meticulous dream diary and studied as much as I could about sleeping in the process. There are a... Read More . Once our trio land in the future, it’s raining cats and dogs. But Doc Brown looks at his watch, says they need to wait five more seconds, and the rain stops completely. The weather service of the future has got forecasts accurate to the second. “Remarkable,” Brown says, looking up at the sky. Reality Check: While weather forecasting technology has come a long way, predicting it down to the second isn’t on the horizon. As Randy Olson points out, weather forecasting services like to be cautious and give you the worst-case scenario, and it’s actually the government’s weather service that is most accurate. In fact, the trend actually seems to be going away from accuracy and towards entertaining weather apps 5 Funny Weather Apps to Make the Forecast Entertaining 5 Funny Weather Apps to Make the Forecast Entertaining Find the weather too boring? Check out these funny weather apps for Android, iOS, and the web that make the forecast more entertaining. Read More . Peeling off a mask, Doc Brown tells Marty he went to a “rejuvenation clinic”. “They took out some wrinkles, did a hair repair, changed the blood, added a good 30 or 40 years to my life. They even replaced my spleen and colon,” Brown says. The future takes its health seriously and wants humans to live long, fulfilling lives. Reality Check: Scientists are actually working hard on this one, and some of the fictional scenarios are already being explored. Among the technologies to eliminate aging Want to Live Forever? 6 Technologies That Could Stop Aging Want to Live Forever? 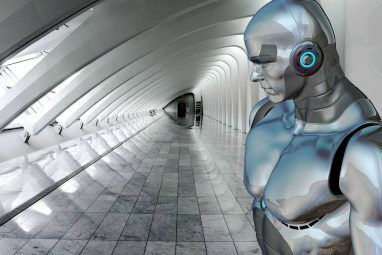 6 Technologies That Could Stop Aging Only the most arrogant mind could think that death could ever be abolished for good - but those arrogant minds have begun to make real progress towards that goal. Read More , researchers are looking at using the blood of younger people to rejuvenate older people, and even printing 3D organs to replace damaged ones. Fiat Physica has a fascinating overview of whether science can make us immortal. To spy on Marty’s kid from the future, Doc Brown stealthily tracks him from a distance using super binoculars, which look a lot like a digital camera. In fact, they can take photos! Through the binoculars, you also get other information like distance and facial recognition. Reality Check: Maybe classifying these as binoculars is the mistake, since this device does the same things as some of the best point-and-shoot cameras 6 Best Point-and-Shoot Cameras: Style, Features or Optics 6 Best Point-and-Shoot Cameras: Style, Features or Optics Some people may want the most stylish camera, others may want superior zoom, and some may be on a strict budget. Don't worry, we have you covered. Read More available today. Granted, zoom technology hasn’t gotten good enough to let you make it as compact as what the Doc is holding in his hand, but it’s certainly getting there. As Marty gets dressed to look like his future son, we witness one of the most iconic moments of fictional future. He steps into a pair of Nike MAG shoes, and they automatically lace up and tighten around his feet. So cool! Reality Check: Hallelujah, Nike says it’s making these shoes this year. In fact, the designer who dreamed up the shoes for the movie is heading the project. Nike even patented the technology for it. And just in case you are doubting whether it’s possible at all, hobbyist Hunter Scott made a DIY pair to show it can be done. While it probably won’t be a mass market item anytime soon, it’s still good to know we aren’t too far off, right? After the shoes, Marty dons a futuristic jacket. Only it’s a few sizes too big for him. “This thing doesn’t fit,” Marty complains. As if on cue, a robotic voice says, “Size-adjusting fit”. The jacket proceeds to shrink and fit perfectly onto Marty’s form. In the future, you won’t buy clothes by size, you’ll just buy what you like, with the onus on the clothes to adjust to fit. Reality Check: While we have plenty of high-tech smart clothing 5 Ways That High Tech Personal Wearables Will Change Your Life 5 Ways That High Tech Personal Wearables Will Change Your Life Will the internet dissapear? 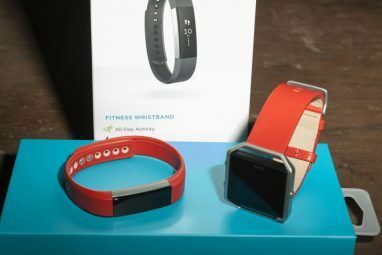 High-tech personal wearables may drive the internet into the background of our lives. Here's how. Read More now, we haven’t yet hit a point where clothes can shrink and expand as per the wearer’s body. The closest thing we have is a smart belt that loosens and tightens when you sit and stand, respectively. The cars of the future don’t just fly, they are also in great shape. Drive into a gas station and the machinery will do a full mechanical check of your car, change the oil if necessary, fill your tank up, and set you off on your way once again. It’s like having a robotic pit crew at your service. Reality Check: In this scenario, reality has actually outdone fiction. Today, you don’t need to head to a garage or gas station to check if your car is all right. You can monitor your car’s performance with your phone How To Monitor Your Car's Performance With Android How To Monitor Your Car's Performance With Android Monitoring tons of information about your car is incredibly easy and cheap with your Android device -- learn about it here! Read More , or use services like OnStar’s diagnostics package. There are other gizmos like DriveBot that fit into your car and act like an always-on mechanic, checking for any issues. As for pumping gas, robots are already on it. As Marty takes in the futuristic scene around him, a hologram of a shark rises from the theater behind, which is playing a Jaws sequel. The shark grows in size and just as Marty turns around, it lunges and snaps at him. Although the shark looks comical to the present-day viewer, the scene is still meant to convey the realism of holographic technology in the future. Reality Check: We have actually seen tremendous progress when it comes to holograms. The technology behind the Tupac hologram The Tech Behind The Tupac Hologram & How It Could Rock The World [MakeUseOf Explains] The Tech Behind The Tupac Hologram & How It Could Rock The World [MakeUseOf Explains] When Tupac Shakur strode on stage at the 2012 Coachella Music Festival to perform a song with Dr. Dre and Snoop Dogg, most of those in attendance were struck dumb with awe. Because Tupac was... Read More means it’s possible to show a hologram of anything that can be shown on a video projector. Microsoft’s Project Hololens Five Questions About Microsoft's "Project HoloLens" Five Questions About Microsoft's "Project HoloLens" Microsoft's new Augmented Reality headset is very exciting -- but can they solve the fundamental problems of AR? Read More wants to transform display technology by bringing holograms into the home. If you loved that scene in Back to the Future II, you’re likely to find the next few years very exciting. Marty continues surveying the future world. He looks into the distance, and where there was nothing at first, suddenly a large screen appears in the air and starts playing a video advertisement. Reality Check: The future of this technology seems, in many ways, to be tied in with that of holograms. Right now, video projection technology is tied in to flat surfaces. The only non-surface video projection is with 3D holograms. So while Internet pop-up ads remain a scourge Let's Put A Stop To Pop-Up Browser Ads Once And For All! Let's Put A Stop To Pop-Up Browser Ads Once And For All! Pop-ups can catch you off guard, and if you're not careful they can create problems. Learn how to avoid them and how to handle them if they do come up. Read More , pop-up video billboards seem some way off. The restaurant of the future doesn’t have a manager or waiting staff. After all, who needs humans when you have screens? As Marty walks into a cafe in 2015, he is greeted by a TV (and it’s a CRT, not a flat-screen) with a video. Another television-like unit goes from table to table taking orders. Reality Check: This isn’t too far off. While human attendants haven’t been eliminated, several restaurants have iPads on each table to place orders directly. This technology is only going to get better as time passes. Apart from not having waiters to take the order, there are also no waiters to serve your food. When Marty orders a Pepsi, it shoots up from the counter. No humans necessary. Reality Check: It’s an advanced, fictional version of a vending machine, but it doesn’t seem likely that this scenario is going to come about unless micro-transportation changes. You would need something like a miniaturized version of the evacuated transportation tube Top 10 Emerging Technologies That Are Changing The World Top 10 Emerging Technologies That Are Changing The World From agriculture to medicine to energy, advancements are being made every day. Learn a little bit about these 10 emerging technologies that could directly affect your life within the next few years. Read More , so don’t count on seeing this any time soon. Marty’s son’s nemesis, Griff Tannen, is a bully with a common weapon of choice: a baseball bat. The bat, however, is uncommon. When he holds it, it’s roughly a foot in length. And then it expands as if powered by a hydraulic mechanism, layer after layer unfolding like an expandable baton. Reality Check: We don’t have anything like this yet, but I don’t think anyone is really trying either. It wouldn’t be tremendously difficult to make this, but it seems pointless when a bat’s material, size, and weight are all heavily regulated. Let’s just enjoy it for the fun, convenient gadget it is and move on. Perhaps the most famous gadget from the movie, appearing at around the 18:38 mark, is the hoverboard! It’s a skateboard without wheels that levitates and glides. And yes, it looks exactly as cool as it sounds. Back to the Future II is actually worth re-watching just for the wow factor of this scene alone. Reality Check: You would think it sounds futuristic even now, but companies have actually built functional hoverboards. The Hendo was the world’s first real hoverboard The Hendo: The World's First Real Hoverboard The Hendo: The World's First Real Hoverboard Marty McFly-style hoverboards have been a dream of science fiction geeks for some time, and the innovative duo behind Hendo Hover might be the first to make that dream a reality. Read More , and recently, Lexus made one for an ad Lexus Made a Real Hoverboard - But It's Not What You Think Lexus Made a Real Hoverboard - But It's Not What You Think Following a month of speculation, Lexus has unveiled a fascinating project to the world: a working hoverboard. It's definitely awesome - but are they being totally honest about it? (No. No they are not.) Read More too. Check out the links to learn Brad’s explanations of how both these hoverboards work. Spoiler: The Hendo is fascinating science, whereas the Lexus is just a toy, but a cool toy at that. Or dumb The Lexus Hoverboard Is Dumb, Epson Kills Ink Cartridges... [Tech News Digest] The Lexus Hoverboard Is Dumb, Epson Kills Ink Cartridges... [Tech News Digest] Another disappointing hoverboard, endless printer ink, Apple Music makes the charts, Netflix plans more launches, proof that you are terrible at driving, and Homestar Runner loves Flash. Read More , depending on your point of view. Remember our earlier size-fitting jacket? Well, forgive the pun, but it has another trick up its sleeve. When Marty falls into a pool and gets wet, the jacket leaps into action and triggers a blow-dryer that instantly gets rid of all the water, and, in the process, drying off Marty too. You’ll never again need to worry about getting wet in the rain. Reality Check: We haven’t miniaturized the dryer to a point where it can fit into our clothes. This is one of those technologies I really hope someone is working on, but a quick search doesn’t show anything worthwhile. The closest thing is people working on water-repelling sprays like NeverWet. But that just doesn’t cut it. Back to the Future II isn’t the first film to suggest the idea of suspended animation. From Captain America to Interstellar, history is replete with lots of science fiction stories looking at the notion of freezing a human and thawing him or her out later on. Perhaps that’s why Back to the Future II uses it only as a passing reference. Reality Check: Suspended animation, or the science of cryonics Your Brain On Ice: Is Cryonics Crazy? Your Brain On Ice: Is Cryonics Crazy? Do you want to live forever? It's not a trick question: a technology called cryonics claims to offer a way to cheat death -- but does the idea hold water? Read More , is actually an advanced field today and you can even pay companies like Alcor to cryogenically freeze you upon your death. While it’s not foolproof and definitely not thoroughly tested, there is ample research to back up the theories. As Griff and his posse is arrested by the cops, local news arrives on the scene. Except it’s not a cameraman with a rig on his shoulder. The USA Today camera is flying, unattached to any human and recording the whole scene. Back to the Future II somehow knew the future of cameras is remote-controlled robotic drones. Reality Check: Drone cameras are only just becoming a mass-market item, but they are definitely a reality. In fact, we have taken a look at several already, like the Hexo+ HEXO+: An Amazing Aerial Camera Drone That Will Follow You Everywhere HEXO+: An Amazing Aerial Camera Drone That Will Follow You Everywhere Imagine you're hiking up the side of a mountain as your aerial drone captures the footage like a scene from an epic movie. Thanks to a new drone called Hexo+, this science fiction may soon... Read More , the Syma X5C Syma X5C Quadcopter Review and Giveaway Syma X5C Quadcopter Review and Giveaway If you've any interest in drones but have been put off by the steep prices, buy the Syma X5C. It's a hell of a lot of drone, and just as much fun. Read More , and the Parrot Bebop Parrot Bebop Drone and Sky Controller Review and Giveaway Parrot Bebop Drone and Sky Controller Review and Giveaway Soar through the sky and see the unseeable with fantastic aerial photos and smooth videos: this is the Bebop Drone and Sky Controller. Read More . When Doc Brown wants to throw Marty’s Sports Almanac into the garbage to deter him from cheating, he doesn’t go to the trash can; in the future, the trash can comes to you, apparently. Meet Litter Bug, a robotic garbage can with wheels. It would certainly be an ingenious way to keep the streets clean. Reality Check: While we don’t have robotic garbage disposal systems out on the streets, gadgets like the iRobot Roomba iRobot Roomba 760 Review and Giveaway iRobot Roomba 760 Review and Giveaway Who doesn't like a clean house? Actually, let me rephrase that - who doesn't like a self-cleaning house? Imagine a world where you needn't lift a finger to sweep or mop your floor. We'll be... Read More robotic vacuum cleaner are already in our homes. There’s also the Scooba, which mops and scrubs the floor to make itself an essential smart home appliance 5 Amazing Home Appliances That'll Change Your Life 5 Amazing Home Appliances That'll Change Your Life There's no denying it, smart home appliances will save you time and money, enabling you to spend more time doing the things you love. Here are some of the best smart appliances available today. Read More . Public robots are probably not too far off. While Doc Brown and Marty argue over the Almanac, the future police find a sleeping Jennifer. A quick fingerprint scan shows them who she is, her current age and address, and all other relevant details. When they take her home, the door also opens by simply pressing her finger against the panel where the door knob usually would be. Secure and easy locking/unlocking! Reality Check: Biometric security is nothing new The History of Biometric Security, and How It's Being Used Today The History of Biometric Security, and How It's Being Used Today Biometric security devices were long held ideals in science fiction movies that seemed plausible enough to actually happen, but a little too far-fetched for real world application. Read More , and fingerprint scanners are among the most popular implementations of it since fingerprints are unique for each person. It has even made its way into our phones (like the iPhone 6 iPhone 6 Plus Review and Giveaway iPhone 6 Plus Review and Giveaway The 5.5-inch iPhone 6 Plus is Apple's latest and perhaps strangest addition to its range of tablets and smartphones. Read More ) for secure and easy locking/unlocking. Although rather than deterring thieves, it perhaps increases the chances of theft Does the iPhone 5S Fingerprint Scanner Increase The Chance of Theft? Does the iPhone 5S Fingerprint Scanner Increase The Chance of Theft? The iPhone's new fingerprint sensor seems like a great way to use biometrics to keep the device secure and personal, but could the feature be used against the owner to circumvent existing protections? Read More . Before setting off to rescue Jennifer, Doc Brown quickly glances at a nearby kiosk full of information, from weather conditions to traffic updates. Back to the Future II didn’t crack the idea of personal computers in our pockets, but it knew instant traffic information will be critical for how we commute in the future The Transportation Of Tomorrow: Awesome Inventions That May Transform How We Commute The Transportation Of Tomorrow: Awesome Inventions That May Transform How We Commute The course of human civilization has always been shaped by transportation. The transportation of tomorrow may not solve all these problems, but it may solve some – and it’s important to give the matter thought... Read More . Reality Check: Today, traffic information is one of the technologies we can claim to have got right to a large degree. It’s not yet 100 percent, but it isn’t far off. Google Maps has built-in traffic updates Google Maps Navigation For Android Helps You Avoid Traffic Jams [News] Google Maps Navigation For Android Helps You Avoid Traffic Jams [News] Read More , and there are several third-party apps like Waze to help you know how to avoid a jam. When the police take Jennifer home, it’s dark in the living room. It’s only when Jennifer says “Lights on”—prompted by the policewoman to do so—that the lamp brightens the room. Voice recognition and voice commands are a big part of the future home, as is smart lighting Brighten Your Home With Smart Lamps: Here Are Your Options Brighten Your Home With Smart Lamps: Here Are Your Options What exactly is a smart lamp, and what's out there? Read More . Reality Check: Smart lamps like the Philips Hue Light Your Home the Smart Way With Philips Hue Light Your Home the Smart Way With Philips Hue If you can afford the initial expenditure, you won't find a better-supported and more user-friendly smart lighting system on the market. Read More are already here, and we take voice activation for granted on our phones. 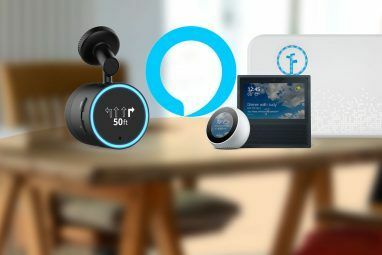 There are also devices like the Ubi Voice Control All the Things: the Ubi Review and Giveaway Voice Control All the Things: the Ubi Review and Giveaway Read More that act as a hub for other smart devices so that you can control everything with your voice. How you interact with the smart home of today isn’t too far off from the version of events in the film. The police wear hats with a ticker displaying a friendly message with their name, and something along the lines of “Hello, my name is Officer XYZ.” In some way, it seems like Back to the Future II predicted a need for a friendlier image for the police force, so that citizen journalists don’t need to spy on them The Citizen Journalists Who Capture Police Shootings Deserve Pay The Citizen Journalists Who Capture Police Shootings Deserve Pay Few people are brave enough to step forward and record police misconduct – those that do deserve some reward for the good they bring to society. Read More . Reality Check: We have already talked about how high-tech personal wearables will affect law enforcement 5 Ways That High Tech Personal Wearables Will Change Your Life 5 Ways That High Tech Personal Wearables Will Change Your Life Will the internet dissapear? High-tech personal wearables may drive the internet into the background of our lives. Here's how. Read More . The name-display tickers are just one element, but a truly tech-connected officer of the law isn’t a distant dream, as you can see with Motorola’s connected law enforcement officer. When Jennifer looks around, the window looks strange. First, it’s showing daytime, even though it’s clearly night outside. And there’s fuzzy static. Soon, we find out that the windows of the future are actually screens, allowing you to turn them into any scene you want. Reality Check: No, this one isn’t happening. More importantly, do you even want it to happen? If your first answer is yes, it’s time to recognize and overcome your technology addiction How to Recognize and Overcome Your Tech Addiction How to Recognize and Overcome Your Tech Addiction Overcoming tech addiction doesn't mean ending your use of that technology, it just means using technology to improve the quality of your life. This guide shows you how to manage your online cravings. Read More . George McFly, Marty’s aging father, has thrown his back out and shows up in an Ortho-Lev, a device which levitates above the ground and hangs him upside down. The movie never calls it an Ortho-Lev, but that’s the name given to it by the folks at Futurepedia, the wiki for Back to the Future. Reality Check: There is nothing like the Ortho-Lev anywhere near becoming reality. This machine combines levitation, medical science, leaps in battery research, and several other technology breakthroughs. However, it seems like an obvious evolution of exoskeletons and how bionics can improve our lives How Bionics Will Extend and Improve Your Life How Bionics Will Extend and Improve Your Life Thought of as a science fiction pipedream, the science of bionics is often viewed as sinister. However, in the real world, bionic technologies can extend and improve your life. Read More . When old Biff gets out of a taxi, the driver slides over a device with the fare written on it. Biff places his thumb on it to scan a fingerprint, the payment is made, and off goes the cab driver. Your money is digital 8 Things You Probably Didn't Know About Digital Wallets 8 Things You Probably Didn't Know About Digital Wallets Digital wallets are billed in most tech circles as the future of real-world payment technologies. Read More , and your wallet is your thumb, so you don’t need to carry a wallet or cards or cash. Reality Check: There’s a bit of Uber in there What Is Uber and Why Is It Threatening Traditional Taxi Services? What Is Uber and Why Is It Threatening Traditional Taxi Services? Uber has landed, and it's fundamentally changing inner-city transit. And some might say, not entirely for the better. Read More , but mostly, it’s all about the fingerprint-scanning credit system. Right now, we’re still at the stage of credit cards and services like Apple Pay and Android Pay Everything You Need to Know about Apple Pay, Samsung Pay, and Android Pay Everything You Need to Know about Apple Pay, Samsung Pay, and Android Pay Android Pay, Samsung Pay, Apple Pay all have their advantages and disadvantages. Let's take a look at exactly how each of them works and who can use them. Read More . However, once biometric technology becomes more secure and convenient, the futuristic scenario played out in Back to the Future II seems like the logical next step to what we’re seeing today. The fruit bowl of the future doesn’t sit on the dining table. Instead, it’s a contraption that stocks all your important fruits, vegetables, and herbs, and which sits quietly in the kitchen ceiling waiting for someone to call for it to come down. When Marty McFly Jr. wants to watch TV, he doesn’t just check what’s happening on ESPN. Instead, using voice commands, he tells the TV to simultaneously switch on six different channels, all of which are then showcased in a grid. Channel surfing just got a major upgrade. Reality Check: The thought behind this makes a lot of sense, and the technology actually exists. We just haven’t seen it yet. Smart TVs are controlled by voice What Is a Smart TV? 6 of the Best on the Market Today What Is a Smart TV? 6 of the Best on the Market Today Most televisions you look at now will be smart TVs, but what is a smart TV and which ones are the best on the market right now? Read More . Picture-in-picture technology is nothing new. Something like Android TV and streaming television channels Cut the Cord Forever With These 15 TV Streaming Channels Cut the Cord Forever With These 15 TV Streaming Channels Cable TV is in decline, as the internet provides cheap, on-demand entertainment. Here are 15 of the best TV streaming services to help you cut the cord. Read More could easily make this happen. It’s a matter of when, not if and how. Reality Check: Today’s trend is to give a personality to artificial intelligence. Apple’s Siri and Microsoft’s Cortana can be funny Geek Humor Included! Meet Cortana, Windows Phone 8.1 Digital Assistant Geek Humor Included! Meet Cortana, Windows Phone 8.1 Digital Assistant Cortana is the best reason to upgrade your Windows Phone early. Microsoft's answer to Siri offers great features and will make you laugh. Read More . The adorable HitchBOT had a sense of humor HitchBOT Asked Humans For Help, So They Drove Her Across Canada HitchBOT Asked Humans For Help, So They Drove Her Across Canada HitchBOT – housed in a bucket and equipped with the ability to ask for a ride – hitch-hiked Canada in under a month. Not bad, considering she can't move without humans. Read More . Carrot is a snarky weather app CARROT is Your Snarky Personal Weather Robot for Mac & iPhone CARROT is Your Snarky Personal Weather Robot for Mac & iPhone A sarcastic robot, with little regard for humanity, working as your personal weather forecaster? That's interesting. Read More . By humanizing technology, we feel a bond that makes us use it more. We have already got there and we’ll only go further down this path. In a throwaway line, when Marty Sr. comes home, he doesn’t like the environment he sees. He walks up to the thermostat and says, “Lithium Mode On.” A beep tells us it has kicked in, and the effect is immediate enough for Marty to say, “Much better.” It’s unclear what Lithium Mode does, but Movie Mistakes guesses that since lithium is used to treat bipolar disorder and depression, this mode adds some sort of calming effect throughout the house. Reality Check: While Lithium Mode isn’t on the horizon, we have made tremendous progress on smart thermostats How to Install and Use the Nest Thermostat to Automate Energy Savings How to Install and Use the Nest Thermostat to Automate Energy Savings If you've ever considered getting started with home automation, purchasing a Nest thermostat is the perfect way to start. In just a week of using it, we cut our energy consumption in half. Read More , especially in terms of configuring favorite settings that can be activated with a simple command. As the real time-travelling Marty waits outside, he spots a dog, walking with his leash held by a flying saucer-like object. Basically, a robotic drone is walking the dog. The future is awesome and weird and just so disconnected. Reality Check: No, we don’t have robotic dog walkers. We do have plenty of related technology though, like Android apps to help with dogs Dog Owners: 5 Android Apps To Help With Your Furry Friend Dog Owners: 5 Android Apps To Help With Your Furry Friend A dog is the only thing on earth that loves you more than it loves itself, but you can still make it love you a little bit more with these great Android apps. Read More . So, we’re getting there, slowly. Another memorable gadget from the film, the Hydrator is essentially an instant oven. The grandmother pops in a miniature pizza the size of a hockey puck, and in a few seconds, it comes out as a large, fully cooked pizza. Basically, the original is a dehydrated pizza, and the machine rehydrates it to make it whole. Now this is one gizmo I really want. Reality Check: Dehydrated food is actually used commonly in space travel, because of its smaller size and longer shelf life. But it’s not like the fictional version depicted in the film. The “instant” nature is an even bigger deal and not even close to being achieved in reality. The coolest food tech we have seen in the recent past is 3D printed food Will 3D Printed Food Remove Humans From The Kitchen? Will 3D Printed Food Remove Humans From The Kitchen? You probably know that 3d printers have been used to create everything from mechanical gears to prosthetic limbs and living human tissue. But did you know that they're also being used to print food? Read More . While the family sits at the dining table, Marty Jr. and his sister Marlene are watching TV through the goggles they are wearing, but both are watching different things. These glasses also double up as notifications for phone calls and other alerts. Reality Check: We have gone way past just watching television on glasses. Apart from simple TV and films, we’ve progressed to mind-blowing gaming on 3D glasses 5 Oculus Rift Gaming Experiences That Will Blow You Away 5 Oculus Rift Gaming Experiences That Will Blow You Away Now that the second generation of Oculus Rift development kit is out and in the hands of developers the world over, let's look at some of the best stuff that's hit the Rift so far. Read More . The famous Google Glass Google Glass Review and Giveaway Google Glass Review and Giveaway We were lucky enough to get a pair of Google Glass to review, and we're giving it away! Read More put a computer around our heads. And in the future, LED contact lenses might make glasses obsolete too Will LED Contact Lenses Make Google Glass Obsolete? Will LED Contact Lenses Make Google Glass Obsolete? A contact lens which displays information feels like something from science fiction, conjuring up images of the Terminator and Bionic Woman. This technology, perhaps Google Glass' successor, is just around the corner. Read More . Finally, the last major piece of advanced technology we see in Back to the Future II is the ability to make video calls, coupled with an advanced caller ID system. The video call was impressive enough back in 1989, but the caller ID is even more impressive. It tells you the caller’s name, age, occupation, address, hobbies, interests, and so on and so forth. What’s Your Favorite Gadget from Back to the Future II? We think that is every major piece of technology featured in Back to the Future II, but there is always a chance we have missed something. 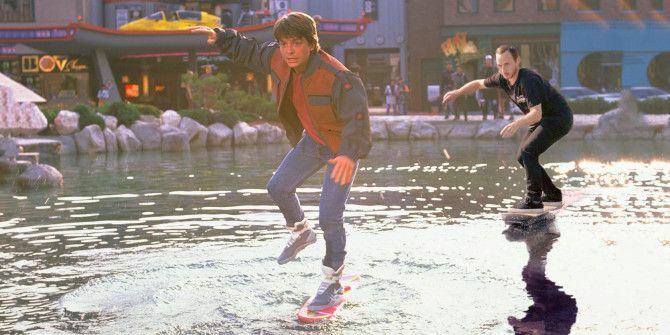 So, Back to the Future fans, tell us what, if anything, we forgot? Alternatively, wax lyrical about your favorite of the futuristic technologies shown in the movie. Please share your thoughts on the gadgets from Back to the Future II in the comments section below. Explore more about: Gadgets, Movie Review, Science Fiction. SiriusXM Essential Means You No Longer Need a CarHigh-Resolution Audio: The Future of Music or a Scam?